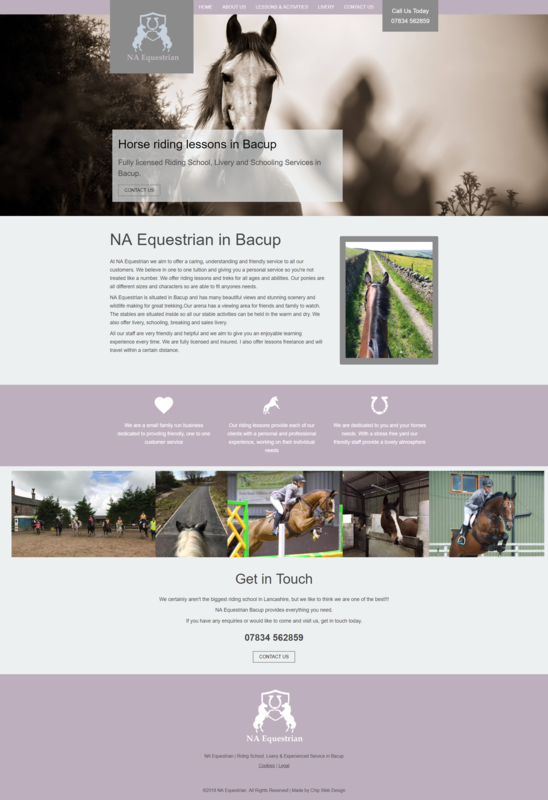 NA Equestrian is Fully licensed Riding School, Livery and Schooling Services in Bacup. With a logo already supplied and a brief for an attractive, easy to use website we set to work creating something that stands out from the norm when it comes to equestrian designs. With the business being relatively new we created a design that has an easy to follow flow, using a calming colour scheme and a big impact image to create an attractive design that compliments the logo we created just what NA Equestrian were looking for. A fully responsive design using css animation to highlight important elements on arrival. We opted for a carousel gallery to show visitors what NA Equestrian has to offer. Our good code foundations ensure the website performs well in page speed tests and meets all Google's mobile requirements.